Devil's Gulch Ranch | We accommodate tours, open houses, and dinners! On the farm tour at Devil’s Gulch, it's quite a climb down and then up to get to the table. Our tour includes some quality time with several baby pigs, so it's all worth it. 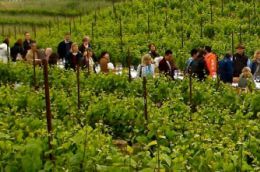 Near the top of the hill, striped with rows of Pinot Noir vines, you’ll find our long table arranged in the middle of it all. Most days, Chef Thomas McNaughton of Flour + Water and Central Kitchen has ingredients from Devil’s Gulch brought to the restaurant. This time it's the other way around. A portion of the proceeds from this event will go to Mark and Myriam’s non-profit program DG Educational Services. DGES provides agriculture and nature educational programs to diverse communities, both locally at Devil’s Gulch Ranch and globally. These programs develop the skills to produce food and live sustainably while building an understanding of our interconnection with nature. 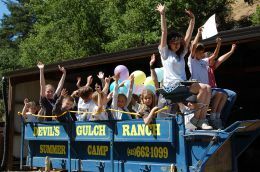 The Marin Y will be running a camp in partnership with DG Educational Services (DGES), located at Devil’s Gulch Ranch in Nicasio. DGES provides agriculture and nature educational programs to diverse communities, both locally and globally. These programs develop the skills to produce food and to live sustainably while building an understanding of our interconnection with nature. Tours, workshops, events and more!